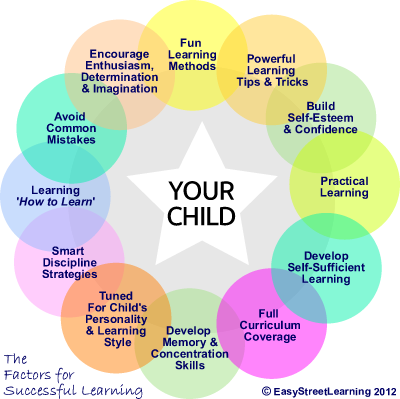 We can help your child become a happy and successful learner. We do this by considering ALL the relevant factors ( see diagram). We'll take the time to get to know your child and listen to your hopes and concerns. Next, we'll develop a learning programme that suits your child's personality, their 'Learning Style' and even their hobbies. What does all this mean in practice? Here's one recent example; Shaun needed help with his story writing. He loves football, so we used this enthusiasm to help him learn how to develop better stories. Together we made a story about a football match featuring himself as the goal scoring hero. We also taught him our 'Secret Recipe for Writing Exciting Stories', which covers every aspect of good story writing. We help children succeed in Numeracy, Literacy, SATs KS 1/2/3, 11+, School Entry, CATs and GCSEs. 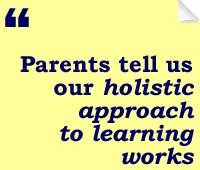 Most parents agree that 'learning' provides the best way for our children to secure a brighter future. 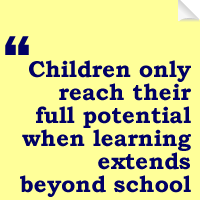 Yet, why do so many children fail to reach their full potential? Sadly parents often simply run out of ideas to overcome the problems they face in helping their children. All too often, their original hopes for their children's education fade away as the years pass. 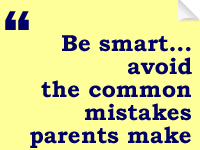 We help parents avoid and overcome the problems that prevent their children succeeding. We help children who are currently 'average' or 'below average' achievement for their age to become excellent and enthusiastic learners. We also help those children already doing very well to achieve even more by showing the relevance of what they learn to real life. Most parents are unaware of the many fun learning opportunities, tips and tricks that can transform their children into excellent learners. We've taken the National Curriculum, and created simple, fun activities that develop every key skill they'll need to succeed. 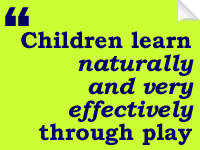 Children learn naturally and very effectively through play. Also, we all know from experience how true the age old saying "practice makes perfect" is. Our fun activities provide a practical way for children to learn, develop and practice the skills they need. We call this process 'Smart Practice' because children are motivated to do the practice that's essential to developing confident skill levels. We have developed step-by-step programmes called 'Learning Tracks' for Numeracy and Literacy for each age group. 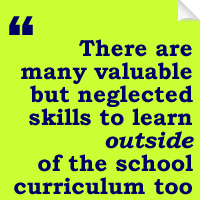 Sometimes parents ask us, "Why should my child learn outside school? Isn't that what they go to school for?" For the answer just ask any teacher, they'll tell you that children only reach their full potential when learning continues at home. They need more time than school provides to practice and master new skills. If your child has started reading, you will know that children can't read well unless they have enough time to practice reading outside of school. We've simply extended this to cover every aspect of what children need to know, so now your child can flourish in all the areas they need to. 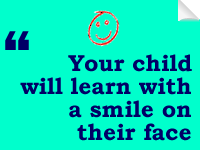 With EasyStreetLearning, your child will learn with a smile on their face. This approach develops a healthy enthusiasm for learning, which is the key to your child's long term success in education and career. Dull worksheets are banished! We have the most engaging and productive strategies to help your child learn. Your child won't be stuck at a desk or computer screen either, instead they'll be engaging with the real world to learn. 'Learning by doing' also has the advantage of showing children the relevance of what they learn. This helps motivate them to learn more. Showing the relevance of what they learn comes from use of quality newspapers, carefully selected websites, museum visits, DVD documentaries, board games, certain computer games, verbal quizzes and even science experiments. For example, recently we helped a child get excited about maths, science and percentages by doing a simple home experiment together to work out the percentage of Oxygen in the air. All this shows children that learning can be fun, exciting and relevant to them. 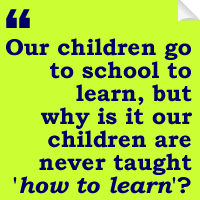 We all agree the that main reason our children go to school is to learn, but why is it our children are never taught 'how to learn'? With EasyStreetLearning, we'll show your child simple but powerful strategies, tips and tricks that will make learning much easier for them. Your child will get much more out of school, they will do better in exams and even in life beyond school. Think of a carpenter - if he only has a few poor tools it will take him a long time to complete jobs and it won't be much fun. However, a carpenter who has a full range of tools can complete jobs faster, to a higher standard and with more enjoyment. It's the same for an 'Excellent Learner'; they have a full range of strategies, tips and tricks they can use to master new skills and achieve success. Depending on your child's needs, we'll also develop their concentration, memory and ability to learn. We also cover how to have exam success by preparing well using 'Smart Practice' and excellent 'Exam Technique'. We've spent a long time talking to parents to discover the root causes behind children's under achievement. 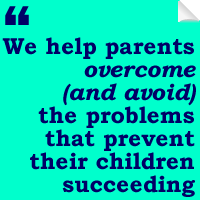 We discovered several common problems that prevent children succeeding and we've created practical strategies to overcome them. We're also constantly collecting the best learning methods from experienced teachers, parents, books, research and even different cultures. The most common problems areas we found were discipline, lack of effective practice and overcoming problems at school. for our article on how to 'Motivate Your Child To Do Homework'. In a competitive world, our children need to get the best results they can to give themselves the most opportunities in life and the government are making exams harder. We cover essential areas such as developing enthusiasm, explaining topics clearly, showing topic relevance, making effective revision notes and excellent exam technique. We carried out a survey asking parents "What life skills would you like your child to have?" What we got was a interesting list of valued skills, many of which are not explicitly taught in schools. Many parents also told us that they believed that children were born with these skills... However, we say it's actually much more about having opportunities to learn, develop and practice the skills. All these skills can easily be learnt by children to help unlock their full potential. For example, children often find percentages boring topic in maths, we explain how they are used for savings and loans which also helps them develop their financial awareness. 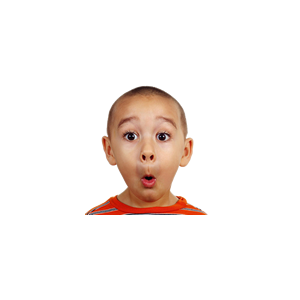 With EasyStreetLearning the results for your child can be dramatic. We have a fresh, holistic approach to learning, taking into account your child's personality, their likes and dislikes and their preferred Learning Style. We give personalised help designed to meet the specific needs of each unique child.